I really can't recall anymore how or why I came upon this book - it definitely wasn't recommended by anyone, so I'm thinking maybe I chanced upon a very cheap copy of it at Book Sale, my favorite bargain/used books store - but I'm very glad that I did. I've been reading light, easy reads lately, and this is one that will truly make your heart and spirits a-flutter. Promise. Love Walked In is the debut novel of Marisa de los Santos, who, research tells me, is half-Filipina (her Asian features are a giveaway, of course). 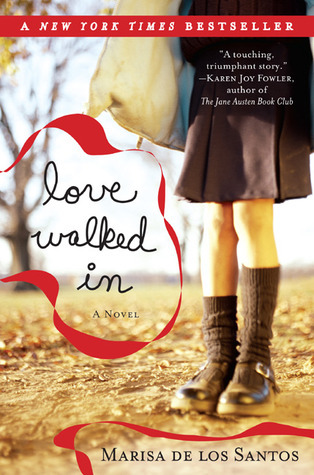 In a nutshell, Love Walked In is the story of Cornelia Brown, the petite manager of Cafe Dora located in downtown Philadelphia, whose "real life" begins when Cary Grant-esque Martin Grace opens the door to the cafe and - you got it - walks into her life. With this grand entrance came a whirlwind of events and people: Cornelia develops a deep friendship with Clare, the eleven-year-old-who-thinks-feels-and-speaks-like-forty daughter of divorced parents and abandoned by a sick mother, and Cornelia's childhood friend and brother-in-law, Teo Sandoval, pays her a surprise visit and rekindles old friendships. The novel was written from two points of view, in alternating chapters: Cornelia's and Clare's, who appear to be the main protagonists. The chapters written in Cornelia's point of view is told from the first person, while those of Clare's are from the third person. The relationship between Cornelia and Clare is the crux of the novel's storyline, and whatever love story that may have developed between Cornelia and any guy seem to be merely incidental. For this reason, I focused more on the Cornelia-Clare angle more than the Cornelia-Martin or the Cornelia-Teo aspects of the novel. One thing I absolutely loved about this novel: the writing. It was lovely, funny for the most part, and smart. I loved, loved, loved it. Likewise, although I haven't seen most of the movies nor read the classic children's books to which the author referred half of the time (like, in every other sentence? ), I could appreciate the references and the parallelisms to the novel's plot. Plus, I loved the bits and pieces about Filipino culture that were injected into the story - Teo Sandoval, after all, was half-Filipino, half-European, and the fact of his being part Filipino, apart from the fact that it made his physical features simply to-die-for, played an important role in building his character. Through him, the author spoke about pancit, its ingredients and how to cook it, Filipino dishes like the puto and bibingka, and, significantly, the traditional Filipino way of showing respect to elders called pagmamano. Whenever I read about Filipinos or the Philippines in books, just like this, I feel truly proud of my roots. What threw me off, however, was the way Clare was portrayed. She didn't seem like your typical eleven-year-old at all - how she thought, spoke, comported herself. On the contrary, she came across as quite mature for her age which, I guess, the author found necessary, considering the situation in which she found herself. I felt like she had no choice but to be mature.